Reset Password/Unlock Account process in ADSelfService Plus is self-descriptive and easy to use. However, if you want to inform end-users of any specific details or change the look and feel of the pages, you can do so manually. This gives you ultimate control in blending the application into your existing environment. 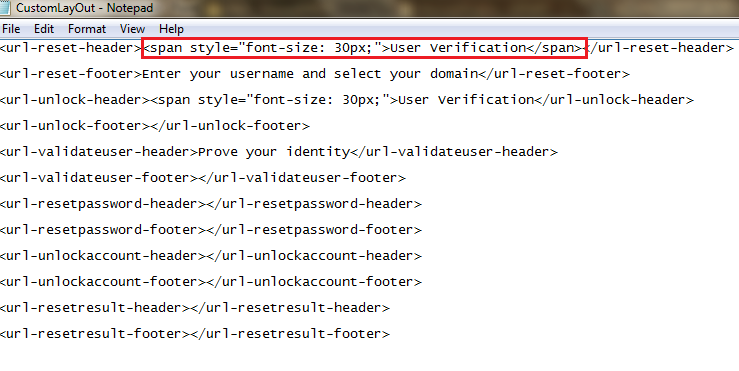 For example, entering the text ‘Enter your username and select your domain’ inside the tag <url-reset-footer> will display the entered text in the footer of the user verification page of Reset Password process.